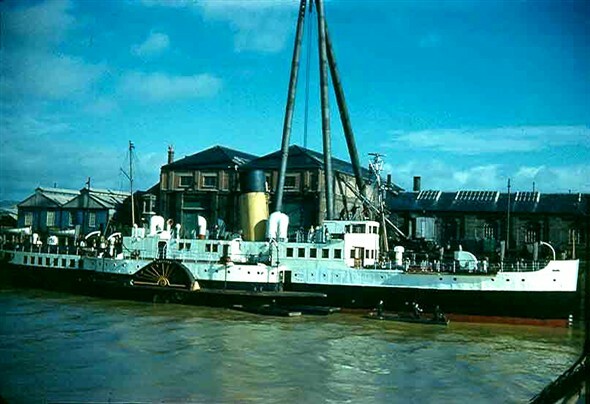 This picture shows the PS Sandown moored under the sheerlegs on East Quay in the early 1960's. I think this was the time when the IOW paddlers had their radar fitted. This page was added by John Hills on 19/04/2009. Looks as though the opportunity for a "paint job" at the same time judging by the "raft" of men alongside. This lovely colour photo similar to the one showing 'P.S. Ryde' at the same Marine workshops working berth gives excellent character to this classic IOW paddle steamer as they both used to be regular visitors to Newhaven harbour before their withdrawal from service on this route. Does anyone have any later pictures of either of these ships? The thought occured to me that there was another long term visitor at this berth. Again another former IOW Steamer, and she was the 'SOUTHSEA' who I recall laid up here for a long period before being sold for possible extended service as a historic preserved 1950's / 1960's vessel. Alas it did not come to fruition after she sailed (or should I say was towed!) off into the sunset for conversion and refit. I presume she must have ended up in a breakers yard after this period to await a similar fate as her sister ship 'Brading' as she was broken up at Harry Pounds yard, Portsmouth back in the late 1980's .There were three of this class but I cannot remember the third ships name, any thoughts anyone? Missed this one - only 4 months late! Yes 'Southsea' was scrapped, not sure but I think it was also at Pounds yard. The third member of this lovely little trio from William Denny's yard was 'Shanklin'. If memory serves me right, she became 'Prince Ivanhoe' and was wrecked off the West Country.